Several members of the largest fish species in the world call land-locked Atlanta home. Whale Sharks (one pictured here) are part of the Ocean Voyager exhibit at Georgia Aquarium. 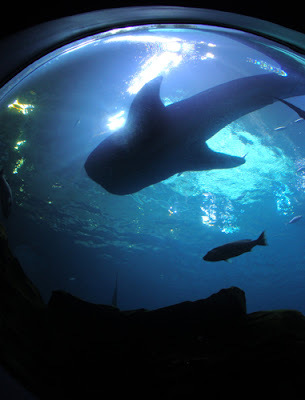 Actually, the Ocean Voyager exhibit was built specially to house Whale Sharks, which share their home with thousands of other fishes, including other sharks, manta rays, other rays, grouper and guitarfish, to name a few. Georgia Aquarium is the largest aquarium in the world and will be expanding with a dolphin exhibit in early 2011. I can hardly wait!